Advanced gum disease also known as periodontitis, is present in nearly 50% of Americans age 30 and above. This condition can often result in tooth loss if untreated. Gum disease is initially a slow moving and progressive disease where symptoms start with red and swollen gums. However at this stage the condition can be reversed with daily brushing and flossing as well as frequent cleanings at Premier Dental Arts. When left untreated, gingivitis can extend into periodontitis where toxins from this bacterial buildup impacts not just gum tissue but also supporting bone. As the disease extends, teeth become looser and require treatment or surgical removal. Premier Dental Arts helps treat periodontitis with a conservative and non-surgical approach using scaling and root planing. 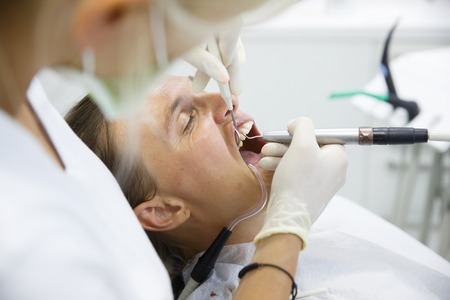 This process involves Dr. Hoss, Dr. Mahtab, or a dental hygienist to treat the teeth by scraping and removing the plaque and tartar off the teeth while also smoothing the root surfaces, helping to prevent bacteria from gathering again. This process may require more than a single visit but will help protect and restore your gums, teeth and bone structure.